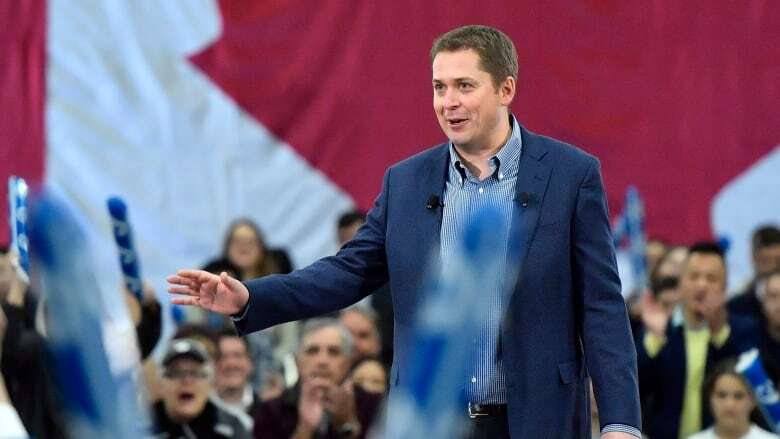 Speaking to a room full of supporters at the Shaw Centre in Ottawa on Sunday, Conservative leader Andrew Scheer offered a glimpse of what Canadians can expect from his party's 2019 campaign. With 365 days to go before the next federal election, Conservative leader Andrew Scheer gave voters a glimpse of what they can expect from his party's 2019 campaign. Speaking to a room full of supporters at the Shaw Centre in Ottawa on Sunday, Scheer said he is ready for what he predicted will be a tough and nasty fight. "The Liberals are going to throw everything they have at us. It's going to get worse, it's going to get nasty." Scheer insisted that the Liberals have already started using negative language. He pointed to Finance Minister Bill Morneau's "Neanderthal" comment during a March sitting of the finance committee and Immigration Minister Ahmed Hussen's​ "not Canadian" comment during a July meeting with Ontario's Minister of Children, Community and Social Services Lisa MacLeod as examples. With the next election scheduled to be held one year from Sunday, on Oct. 21, 2019, polls indicate that the Liberals have an edge. Scheer said that the Liberals will have media, academics, think tanks and "everyone who wants to lecture you on how to spend your money" on their side. But he reassured supporters that they are winning in other areas, such as fundraising, where they have continued to outdo the Liberals. He also pointed to the recent by-election which saw the Conservatives gain a seat in Chicoutimi-Le Fjord, Que. The Tory leader took shots at areas where he said the Liberals have fallen short, but did not go into great detail on how he would do things differently if elected in a year's time. Scheer again criticized the Liberals' carbon plan — which he has lambasted since taking the helm of the Conservative party — reiterating that he would immediately repeal a carbon tax that the Liberals are set to implement at the beginning of 2019. "Justin Trudeau says he wants to fight the next election on the carbon tax? I say bring it on," he said to applause from supporters. Scheer has not yet revealed his own party's carbon plan, but insisted that the carbon tax is a cash grab rather than a plan to reduce emissions. He also criticized the Liberals' over their handling of pipelines and their management of federal funds. The Liberals campaigned in 2015 to run annual deficits of no more than $10 billion and to balance the books by 2019, a promise which they have since abandoned. Scheer pledged that his party would halt deficit spending if elected but did not say how. Scheer blamed the Liberals for emboldening "radical" protestors intent on stalling construction of the Trans Mountain pipeline expansion. Scheer said he would redouble efforts to build the Energy East pipeline which was meant to transport crude oil from Alberta and Saskatchewan across the country to be refined or exported from facilities in New Brunswick and Quebec. The project was cancelled by TransCanada last year. Scheer was preceded by three Conservative MPs, Pierre Poilievre, Richard Martel — who won the recent byelection in Chicoutimi-Le Fjord — and Leona Alleslev, who crossed the floor from the Liberals just over a month ago. In her remarks, Alleslev said part of the reason she left the Liberals was the government had no plan to reach the NATO defence spending target of two per cent of GDP. "They said they were going to be a member of NATO and add to the two per cent of GDP," she said Sunday. "But there is no plan whatsoever to get to that amount of money." In 2017, NATO Secretary General Jens Stoltenberg criticized members for not meeting the spending target. Canada is the country furthest away from the target, but the Liberals have insisted Canada contributes to NATO in ways other than defence spending. Scheer did not mention whether the Conservatives would commit to hitting the target during his speech.